Ambos is the sister and brother duo of Silje and Hogne Midtbø Vevle from Valestrand, Norway. They share their own brand of fiddling on both the hardanger and the standard fiddles with a sample of Norwegian and Canadian selections for your listening and dancing pleasure. Some of these are traditional fiddle tunes of Norway and Canada while others are selections composed in these respective folk music traditions. The reasons they selected this name for their duo are many. Firstly, the word "ambos" is Spanish for "both." Silje and Hogne wanted a name that was easy to pronounce in both English and Norwegian. Secondly, they wanted a name that also had meaningful connotations attached with the duo. In their case, the word represents both Hogne and Silje, both the Norwegian and the Canadian music heritages, both hardanger and standard fiddles, both traditional and new sounds, and other meanings as are discovered by the listener and the musicians. According to Silje, "It might sound a little strange and unfamiliar at first, but it gets better once you get used to it." Silje (b. 1988) and Hogne (b. 1993) both started playing hardanger fiddle at age five, studying with Norwegian hardanger fiddle instructors Jon Jelmert and Håkon Høgemo (two time Norwegian national hardanger fiddle champion) as well as studying solo piano and playing standard violin. They have competed at various Norwegian fiddle contests in solo and mass group classes for hardanger fiddle, and both are members of their local fiddle and dance group Osterøy Spel- og Dansarlag, having appeared on the troupe's 2003 album Spikjespel and the troupe's 2012 album "Fela Liv." Both have appeared as soloists and as a duet at various community events on the island of Osterøy, including May 17th (Norwegian Constitution Day) celebrations, Osterøyfestivalen and the 200th anniversary of the birth of legendary Norwegian violinist Ole Bull in 2010. They have performed at public and private functions in the regions of Osterøy and the City of Bergen and area, including as invited soloists with regionally recognized concert band “Sandviken Ungdomskorps”, Bergen's Fargespill (Musical Colours) before the Queen of Norway, and the Bergen International Music Festival (Festspillerne i Bergen). When not in concert and dance with other musical acts, both Silje and Hogne perform acapella and with piano accompanist Trent Bruner. 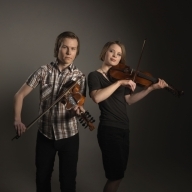 Silje and Hogne have studied Shetland fiddling with recognized Shetland fiddlers Kevin Henderson and Maurice Henderson and have studied Canadian fiddling with championship Canadian fiddlers Patti Lamoureux and Calvin Vollrath. Both have also competed in Western Canadian fiddle contests, placing in the finals of the junior classes and appeared together as guest performers at the John Arcand Fiddle Fest in Saskatoon, Saskatchewan (August 2005 and August 2011), with their 2011 appearance as the opening act for recognized Canadian fiddler, guitarist and vocalist J.P. Cormier and The Elliott Brothers. The duo has one album to their credit titled "Our Way." It was recorded at Keyteck Studios in Hague, Saskatchewan, Canada.